You know this already but Tony Pauline is the best draft insider in the business. The draft wouldn’t be the same without Tony, his analysis and his information. Today he posted a two-round mock draft. I wanted to spend some time discussing how it would play out for the Seahawks. The mock doesn’t include any trades so the Seahawks pick at #21. They’ll almost certainly move down, possibly multiple times, to add to their league-low four draft picks. Tony has them selecting Florida State’s Brian Burns. If they were to move down to a range between #30-40, who else would be available based on Tony’s projection? This would be a good looking scenario for the Seahawks. They’d be able to trade deep into the second round and find some superb options remaining on the board. In my last mock draft I had Andre Dillard, Cody Ford and Marquise Brown as top-20 picks. Here they’re all available in the late first or second round. Parris Campbell and Terry McLaurin are late second round picks while Montez Sweat and Jaylon Ferguson are still on the board too. It’d be a fantastic opportunity to trade down and still land a significant talent. It’s also interesting that no quarterbacks go in round two after the initial four in round one. This would present a possible opportunity for the Seahawks to take a QB in rounds two or three, as discussed recently on the blog. I’m not sure how likely it is that some of these names will last as long as suggested. But it’s important to consider other projections and scenarios. In Tony’s mock there would be plenty of options for the Seahawks after inevitably trading down from #21. I just dont see Burns as a three down player? Not sure if he will see the field enough to warrant their first overall pick unless he could be used at OLB. Seems more of a situational player. Rob,what do you think of Chauncey Gardener-Johnson? He seems like a player the Hawks could select. Can either be a nickel corner or a safety. Extremely ‘Seahawky.’ I think there’s a real chance him or Adderley end up a Hawk. Agreed. I hope we pass on him unless he is a great value and available later. I think legit three down DTs that can pass rush and play the run like Jarran Reed are too difficult to come by and I would not trade a player like that. I would build around him. Hot take: Given the choice, I would keep Reed over Clark. Not a crazy take at all, IMO. Yeah, more like a tepid take. Seahawks have consistently wanted a pass rushing tackle who is good against the run. They traded for Richardson giving up draft capital to try and secure one and have found their own in Reed. I can’t see the team not signing him to an extension. I think they have enough cap space to sign their own significant players needing extensions it is just they may not have enough room to go out and sign expensive free agents. Like they will sign or franchise Clark I think they will sign Reed to an extension. Fun question….I can see Clark being traded before Reed. Partially due to savings on the Cap and how finding a push up the middle has been the Hawks great white whale for years as taxspecialist mentions. Not an expert but it seems that if you traded Clark you could potentially scheme to “fabric” the pressure with some outside blitzes. I doubt either those will be traded, but I also see interior pressure as a more unique thing. PCJS were able to get some value FAs on the outside. Nothing flashy, but I think getting some decent/good outside rusher is easier. But Clark is FA, so trade would be unlikely (even with the tag). literally only “experts” on msm websites thought we would take a CB with our 1st pick. The blog was diving deep in the 3-5th rds for corners due to the previous seahawks drafts. Not really, everyone on here was thinking they were going early with a DB that year. We had talked about griffin as a possibility but everyone thought they would pick a db earlier then that. Nobody thought they would wait til the third round to take a corner in that db rich draft(or take McDowell). I was just thinking they might again poke at the end of the talent cliff like they did in 2017. I seem to remember everyone thinking they would take Kevin king in the early second round because of his freaky athleticism that year. Kevin King was somebody we discussed a lot for various reasons — in particular his physical profile and the way it fitted into Seattle trends. Not just the length either — but other tests like the short shuttle. Let’s be clear though — he was one player discussed among many. In my last 2017 mock draft I had the Seahawks taking Garrett Bolles — a player we discussed much more than King in 2017. Had Bolles lasted to the Seahawks he could’ve easily been their choice. We spent a large bulk of the early draft season talking about Haasan Reddick before it became apparent he was rising and rising out of contention. We talked a lot about Jarrad Davis and Adoree’ Jackson. Plenty of people wanted Seattle to draft Cam Robinson (I didn’t personally). We also talked at length about Obi Melifonwu and Takk McKinley. Kevin King might’ve been a darling for Seahawks Twitter. On here he was simply one of a number of players we discussed pre-draft. Tony has Dexter Lawrence falling to 26 which is interesting. If he reaches 21 somehow I don’t know if I could pass that up. But the Hawks seem certain to trade down to 30-40 anyways, so I’m not getting my hopes up, but damn I wanna get my hopes up haha. Of the people listed at 30-40 I would go with either Sweat or Deebo/Campbell/McLaurin. My prediction is that we trade down and pick one one of those four. Though I also have a feeling a surprise pick might come, where PCJS falls in love with a guy and just goes for him before anyone can consider it. I will put $20 down right now on that guy being Preston Williams. That would be something wouldn’t it. There was rumor floated today on 710 ESPN that Seattle is interested in a USC safety… this draft cycle. Overall production was really good in CFB, but this last year he was down from previous years. The rumor involved a roughly 3rd round pick… since he is long and has good range. The reasoning behind the pick would be a guy who could play SS / LB hybrid position. I’m 99% sure they were talking about Marvell Tell III. 6’2″ 195 lbs. If it’s a USC safety it will be Tell. Decent athlete. When talking about safety’s for the hawks. Does length apply like it does at corner? Or does athleticism and a specific skill set fit better? Kam “hard hitting sting safety”. Earl “insanely athletic free safety”. Tedric “ball hawk free safety”. Delano “hard hitting strong safety”. It’s hard to work out a profile. With other positions we’ve been able to identify trends. At safety they’ve taken many different body types, athletic profiles and players who run 4.4’s or 4.6’s. Hard to work out. I wonder if Deonne Buchanon is an option for this role. Kind of another version of Cam- is also buddies with Cam. Seems like hes on the way out in AZ. He could probably be had at a reasonable price. It’s an interesting look at potential trade partners when wanting to trade down. GB may be a partner in trying to secure Hockenson @ 21. Tennessee is looking for inside push, hoping to get Simmons. They may settle on Lawrence, leaving Hockenson available for Seattle, to trade with GB. 1. 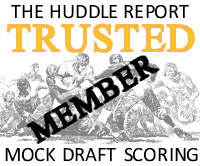 (Trade w/ GB) 21 & 5th Rd (160) for [(30) & 3rd Rd (75) & (195) 6th Rd for Hundley] + 21 pts. Then NYG, after getting the QB for the future, and in need of OL help and could be a trading partner with Seattle for Dillard, ahead of LARs. Lastly comes BUF, who is all in on rebuilding their OL by taking the #1 OT with their 1st pick, BUFF trades up to 37 for David Edwards, who slid out of the 1st Rd. Picking ahead of Detroit & JAC, who were also looking at David Edwards for OL help. This will give Allen book end tackles to help keep him upright while in the pocket. They may be able to add another 4th Rd pick @ 116, by trading down again with CAR @ 47, for them to replace Peppers with Ferguson, and pick Hanks @ 47. Or, they can pick Ferguson @ 40. There are a lot of options. So, there just might be a chance to trade down after all. GB trade seems pretty awful. 21 and 160 for 30, 75 and 195? That means trade down with two picks just to get a third? They did something a bit similar (18 & 248 for 27 & 76 & 186), but that meant move down just once (18->27) and got a pick and moved up (+76 and 248 -> 186). I hope if they move into almost mid-second round they’ll get at least 2 4th round pick, but more likely two 3rd round picks in return. Moving back into the range of 50th pick would net 400 points. You could get 68th and 88th picks for that. Or 78th, 90th, 122nd and 202nd. That would give us 2nd (50th), 3rd (78th), 3rd (84th), 3rd (90th), 4th (117th), 4th (122nd), 5th (148th), 7th (202nd) – 8 picks. Actually, it’s a better trade than the one you referenced, from a value standpoint. Your example only neted a +8 Pts. Where as the suggested trade with GB neted a + 21pts, which is equivalent to a high 6th Rd pick. I guess the genus of this is the higher your pick, the higher the value that is needed to match that pick. The onus in the trade with GB is that they were in need to acquire Hockenson’s services. So, they could be willing to give up the value of a 6th Rd pick for that acquisition. The NYG trade is even more in the Hawks favor, wanting a 4th & a 5th, which could just result in a 4th & a 6th, (180) instead. That would result in a +14.5, which is comparable to a mid 6th Rd pick. Which is also a fair trade, and perhaps more reasonable. At any rate, it is all hypothetical, and may not come to fruition at all. But, who knows, there just might be a chance. Heres to hoping Pauline’s comment about Kyler Murray falling in the draft proves true, and the Hawks will have the opportunity to select him. Seattle better be prepared to make a selection at 21 if there’s not an acceptable trade down offer on the table. We’re not just giving away the pick for the heck of it. We could still trade out of the 3rd round if need be. Well yes, they will be prepared. But the chances are they will get a suitable deal. I agree with you that Russ under center gives a team a better chance to win in the SB than Goff. There’s no doubt experience matters, especially in big games. Goff looked scared and overwhelmed in his first SB, while Russ has played in two SB’s and Brady has played in a lot. Who’s going to be more calm, poised in that extremely pressure packed situation? This is the argument for keeping RW, even though its going to cost a tremendous amount over the next 3-5 years. Possibly at the expense of retaining key players (KJ, Reed, others) or signing top free agents. But the most valuable NFL commodity is a franchise QB still at the top of his game! We just can’t let him get away!! Not even for three first round picks! It doesn’t matter where the QB is drafted. Goff was 1/1, Russ was a 3rd rounder, Brady was a 6th round pick. Some picks work, some don’t. Having an elite, franchise QB with experience is obviously a good thing. Probably 15 QBs in the league that would have won that game in place of Goff. He stunk. Thinking about the RW contract situation, I’m surprised there’s been no mention of the upcoming CBA negotiations. They may want to delay signing a monster contract until the terms of the new deal are hammered out. I’m not sure that’s a problem. After all, the only thing that could happen is the league continues to increase the cap in stages. Not sure it would mean year one — bang —- the entire structure has changed. Aren’t they looking at redoing the franchise tag though? I could be misremembering. Maybe. I tend to think you have to focus on what you can control in these situations. That has been an issue in basketball. The best players have refused to sign long term contracts until after the new agreement terms and higher salary cap are known. It’s funny that for a team sport the salaries of individual players have varied widely. In 2018 the Seahawks had starting linebackers making anywhere from 14 million for Wagner to 0.5 million for Kendricks. My solution – which will never happen – cap players salaries at some amount, lets say 30 million. That will give more money to the rest of the players. Set the floor higher for the rest of the team. Here’s my first mock (1 round). I had already completed this prior to this Tony’s post so I was gratified we agreed on at least a few picks. 1. Arizona: Quinnen Williams, DT, Alabama – best player in the draft. 3. NY Jets: Nick Bosa – …and the Jets couldn’t be happier. 4. Denver (via Oakland): Drew Lock – Elway is smitten. 5. Washington (via Tampa Bay): Kyler Murray – Daniel Snyder loves to make a splash – sorry Kyler. Murray gives them a way to weather the Smith injury and look to the future. 7. Atlanta (via Jacksonville): Ed Oliver – great value here for both teams. 8. Detroit: Clelin Ferrell, Edge, Clemson – The second or third best edge falls to Detroit and makes their dreams come true. tackle or move inside and be dominant day on starter. 11. Cincinnati: Devin White, LB, LSU – The fastest linebacker in the draft fits a big need. Fitzpatrick last year and Williams would give them a solid backfield. won’t be Bortles) they need to re-establish their offensive line and Taylor would be a great start. line because it’s the best thing you can do when Tampa Bay is in disarray. due to his size. Mullen is a bigger corner at 6’1” and 200 lbs. 18. Minnesota: Andre Dillard, OT, Washington St. – Minnesota will choose from Dillard or Ford here. Dillard is a tackle who could move inside if needed. Sold. 21. Oakland (via Seattle): Marquise Brown, WR, Oklahoma – Gruden loves to draft wide receivers. The Davis family loves to draft speed. should start for a long time. concerns push him down. Wait this is Oakland… what character concerns? their run defense. Either guy would help. Jones is supremely athletic and could be the next Michael Bennett. He’s a bird in the hand. great lateral quickness and would be a guy Jackson could depend on. He’s made for Baltimore. two second round picks. Mac Wilson is a great tackler and can cover. of OL help. Dieter is a technically sound guy from just down the road that would be a perfect fit. they’ll bring him back so they need a pass rusher. 32. New England: Noah Fant, TE, Iowa – Gronk is beat up and he ain’t gonna last forever. 2 guys in here are becoming some of my favorite prospects in this class. Florida’s Jawaan Taylor. Incredible talent. ‘Bama’s Mack Wilson is one of the more unique LBs to come along in awhile. Has the ball skills of a DB. Has some Shazier and Eric Kendricks to his game. The kind of versatile LB today’s NFL is falling in love with and needs. Early days, but frankly I like your mock better than Tony’s. Walker at the bottom of the 2nd looks way better than Burns at 21. Anyone know if Walker will be ready for the combine?? Cody Ford would also be an option. I think the one thing Pauline will be wrong about is Murray going later than he has him mocked. I think he will have an amazing combine and individual workout as those are the perfect setups for him to show his elite athleticism and amazing arm talent. His stock will only go up IMO. If he does fall and is on the board at 21 then I think all bets are off with regards to trading down. Rob if Murray is on the board at 21 do you think the Hawks pull the trigger and what would that do for the balance of this draft as we would only have 3 more picks (3,4,5)? I think they will trade down in any scenario. I’m sure you’re correct on this, regardless of who’s still on the board at 21. Every year it seems for every team looking to trade back, there’s more teams who want to trade up. Does this seem accurate? Thus, there’s always some fair, even good, trade back options for teams like the Hawks. If Murray, Polite, Hockenson, any of the Clemson gang are still on the board, our chances of a good trade back seem pretty high, since any of these players may be highly coveted by one or more teams. It’s still fun to to think of who the Hawks would stay at 21 for, although the answer is probably obvious… only for those who go in the top 10 or so. The formula is simple to me…trade back at 21…take the best player available…most likely a lineman. It very well could be an offensive lineman…Ford or Dilliard…i prefer Dilliard(more fluid). And with that extra pick or picks they will select a linebacker or two. Although i know next to nothing of the quality of linebackers…or the depth in this draft…I would think that there will be three major runs in this draft. Quarter backs, D linemen, and offensive linemen. After the dust settles, it seems logical that Seattle will be able to get a couple linebackers who will become starters. There is a lot of talk about drafting a qb to leverage russel wilson’s contract negotiation, but what about drafting a linebacker to leverage Bobby Wagner? Bobby’s extension is much simpler. The highest salary for a LB is currently only $12m. Making Wagner the highest paid LB will be very simple. There’s no need for leverage there. I would not call Bobby’s extension simple. What would the Patriots do? They certainly would not even think about having the highest paid linebacker in the league on their roster. Yo…i love Wagner…but do we need to make the same mistakes over and over. No third contracts…please. Yes we are talking about a hall of famer…no we are not talking about a quarterback. 12 million is not much money it seems…but it could be the difference between having a better special teams unit than we had last year. The patriots do not rob paul to pay pete…or in the seahawks case…rob their entire depth to pay percy, Jimmy, and now Bobby. It’s a bad sign to have the highest paid position player on your roster…unless your talking about the quarterback. 1. I didn’t say it was simple. I said it was much simpler than Russell Wilson’s extension. And that is a cast-iron fact. 2. The Pats paid Dont’a Hightower $10m this year and are on track for $11m for the next two seasons. That’s $1m less than Luke Kuechly’s league-high average salary. The Patriots are very comfortable paying a linebacker a top salary. 3. Just because some third contracts haven’t gone according to plan doesn’t mean you get rid of every great player you have after two contracts. That’s called throwing the baby out with the bathwater. 4. If it’s bad to have the highest paid position player on your roster, why did the Rams just make the Super Bowl with the highest paid DT and highest paid RB on their roster? 5. The Patriots are paying Stephon Gilmore a kings ransom. 6. People need to stop comparing the Patriots to other teams. You’re allowed to make those comparisons when your team has Brady and Belichick. Combine that with an equally-absurd class of rookies, and it makes me think the Seahawks must already have a plan to secure one – if not multiple – impact D lineman. Rob, based on the astonishing breadth & depth of the FA + draft of D-lineman, do you think free agents might be met by a surprisingly cold/deflated market? There’s so many options that teams might be in no rush. My prediction is the Hawk’s sign a guy they like in free agency, allowing them to enter the draft with more flexibility (trade back). It’s certainly possible some of them could receive colder markets than usual. I would expect Lawrence and Clowney to receive mega money if they even hit the market. Some of the others might be in that Bennett/Avril situation from 2013 — being left to consider a prove-it deal to re-enter the market. Which would work nicely for Seattle. I agree with your prediction too — as long as the prices come to the Seahawks. Because they won’t be able to spend big on one player in FA. Hey rob, you’ve talked up a few different receivers this year. I want to know out of Parris Campbell, McLauren and Preston Williams, who would you draft 1st and why? Who is your favorite out of the three? H on Kansas City Chiefs to trade for Frank Clark? SamL on Kansas City Chiefs to trade for Frank Clark? Georgia Hawk on Kansas City Chiefs to trade for Frank Clark?